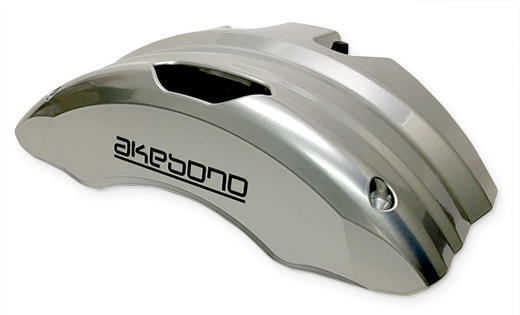 Akebono Develops World's First "New Construction Brake Calipers"｜News｜Akebono Brake Industry Co., Ltd.
Akebono Develops World's First "New Construction Brake Calipers"
Tokyo, Japan - (June 13, 2018) - Akebono Brake Industry Co., Ltd. announced today that it has developed the world's first "new construction brake caliper." The new brake caliper is based on the construction of the existing product, the AD-Type disc brake, and has been modified extensively to meet specific requirements for automobiles that use electric power sources, and to be friendlier to the global environment. Akebono has a wealth of experience in developing disc brakes. Particularly, the technological know-how derived from developing both the AD-Type disc brake (floating type disc brake) *1 which was first created in 1978 using the company's original technologies, and disc brakes for high-performance automobiles (opposed-piston type disc brake), have been utilized extensively. The material for this brake caliper is aluminum, with which weight reduction of up to 30% was realized. This lightweight construction contributes to lowering the vehicle's fuel consumption. Furthermore, uneven wear of the brake pads can be reduced to 1/5 of existing products. This revolutionary product also takes into consideration adaptability to different automobiles, as well as visually appealing design. Development of this brake caliper is slated for completion by the end of this year, and the production system will be ready in 2019. With the new construction brake caliper at the core, we will continue to integrate and develop the technologies that have been accumulated over the years, and the technologies that have been newly developed to promote differentiation. From the viewpoint of technological consistency, these new technologies will be applied on various products, including electric brake calipers, as well as brake calipers for commercial vehicles and industrial machinery. As onboard systems become more complicated with the progress of automobile electrification, brakes are required to possess stable stopping power, be lightweight in construction, as well as minimize drag. With the new construction brake calipers, Akebono is offering a new value with its brakes by realizing both superb functionality and visually appealing design. Akebono will keep pursuing the development of unique technologies to continue the challenge to lead the world in the area of the company's core competencies, "friction and vibration, their control and analysis." *1 In the 1970s when emission control regulations required vehicles to be equipped with numerous auxiliary equipment, the weight of automobiles increased as a result. Under such circumstances, the AD-Type disc brake was developed in 1978 using the company's original technologies, meeting requirements for reduced weight, stronger capacity, and resistance to rust. In 1982, Akebono received an award from The Japan Society of Mechanical Engineers, a first in the automotive parts industry, for the "development of a new type of disc brakes for passenger cars." In 2011, the AD-Type brake was registered in the National Museum of Science and Nature's "Registry of Essential Historical Materials for Science and Technology."